The city of Bologna is famous for its cuisine and its covered porticoes, but recently it is making headlines for other reasons. From April to September each year, the city’s initiative “Bella Mossa” kicks into full swing. “Bella Mossa” translates to “Good Job” or “Good Move” and it is a way to not only benefit the environment but to be rewarded at the same time. Users of sustainable forms of transportation such as bicycles, will be rewarded with free beer, ice cream or film tickets. Going around on foot, car sharing, riding city buses and trains, and carpooling are also considered point-worthy according to the app. To participate, all it takes is an app on your smartphone. The Better Points app will allow you to log up to four trips a day. You gain points based on the number of trips taken a day, not on how far you travel, so you do not have to go too far to gain points. Over 100 businesses around the city have signed up to be a part of this green initiative. Users will receive discounts or vouchers to spend at partnering businesses. Anything from discounts on groceries at supermarket chains to free drinks at local bars to free gelato is attainable with your earned points. 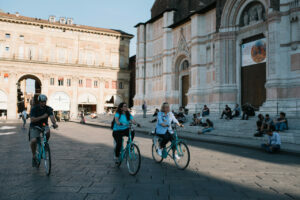 Bologna has always been a relatively eco-friendly city, even before this sustainable transportation initiative began in 2017. It is a city with a historic center that is vastly pedestrian, and many people ride their bikes since parking is limited. While it is a magnificent incentive for visitors and locals to leave their cars at home and win points for their eco-friendly efforts, the benefits of doing so are tenfold. There’s no better way to explore the beautiful city with its brick buildings and towers and marble arches and walkways than by foot or by bicycle. In the first six months of action, nearly 4 million kilometers were logged in the app. Last year from April to September of 2018, 673,000 kilometers were walked, 980,000 kilometers by bike and 1.9 million kilometers were logged by the app on public transportation. Bella Mossa reduced car use in its users by over 65%, and 80% of users set their bodies in motion more than in previous years. The “Bella Mossa” is funded by the EU and the city government of Bologna.